Peter Hurd "The Ranch at San Patricio"
"The Ranch at San Patricio"
We are guessing that this is the Hurd Ranch. don't do the piece justice. A regionalist painter known for his landscape, figure and genre paintings of New Mexico, Peter Hurd was especially focused on capturing light and atmosphere. 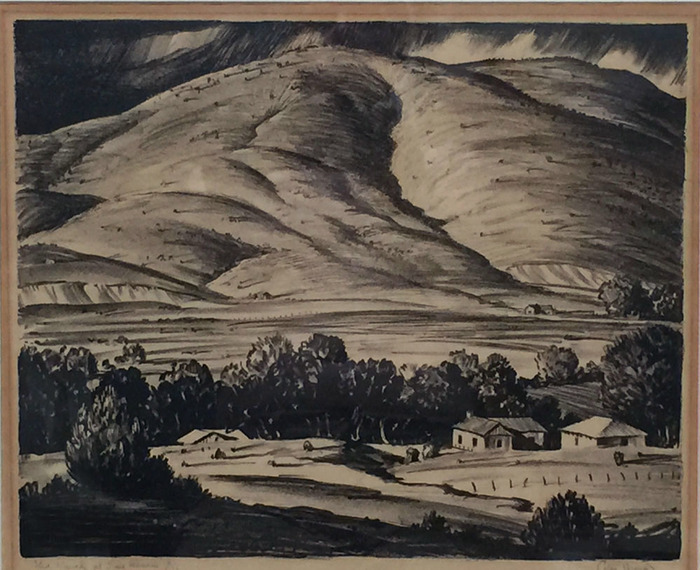 His preferred medium was tempera on gesso panel, and many of his works depict the panoramic views he saw from his beloved ranch land as well as the people with whom he was most familiar---Indians, Mexicans, and Caucasians. He was also a muralist and did many lithographs and watercolors. Hurd was born in Roswell, New Mexico on February 22, 1904 as Harold Hurd, Jr. Called Pete from his early days on, he legally changed his name to Peter in his early twenties. In 1921, he enrolled as a student at West Point Military Academy in New York state. Selling a painting to a supervisor, he felt encouraged to become an artist instead of a military career man. In 1924, he enrolled in the Pennsylvania Academy of the Fine Arts and also took private lessons from well-known illustrator N.C. Wyeth. In 1929, he began to work in tempera on gesso-prepared panels, which became the medium he most frequently used. He married Wyeth's oldest daughter, Henriette, in 1929, and took his bride to New Mexico, the place of his birth, for an extended honeymoon. They later established their home in the southern part of the state in San Patricio, and Henriette also became a prominent artist. In the mid-1930s, he was a mural painter, completing post-office murals in Big Springs and Dallas, Texas, and in Alamogordo, New Mexico. During World War II, he was a war correspondent and artist for Life magazine, a job in which he used his military background. His special assignment included a bomber base in Britain. Hurd was raised in New Mexico and was educated at New Mexico Military Institute 1917-20. Appointed to the US Militray Academy, he resigned in 1923. 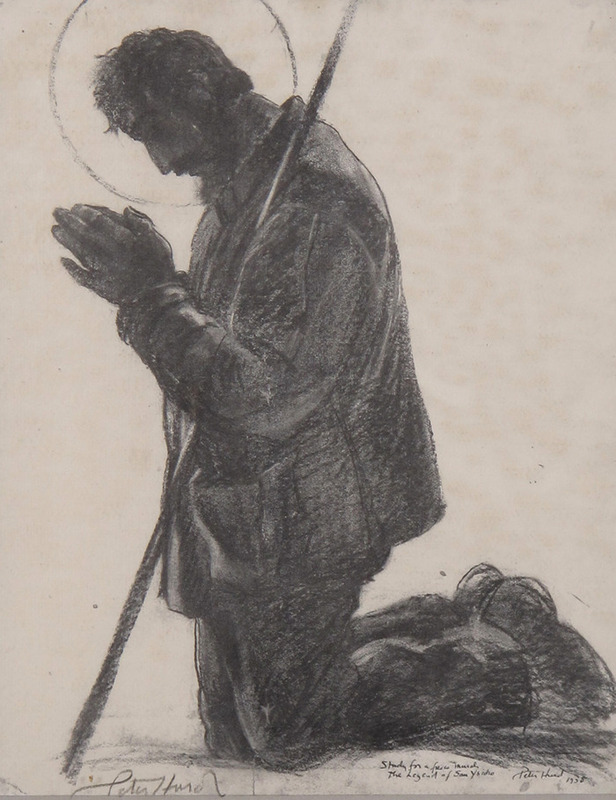 He attended Haverford College, 1923-24, but left to be a private non-paying pupil of N.C. Wyeth. He lived in Wyeth’s barn at Chadds Ford, Pennsylvania for three years, also studying at the Philadelphia Academy of Fine Art. Hurd worked as an illustrator, particularly for books. In 1929, he married Wyeth’s daughter, Henriette, a professional painter and sister of Andrew Wyeth. By 1931, Hurd was living on a ranch in New Mexico. In 1935, he began painting in tempera. 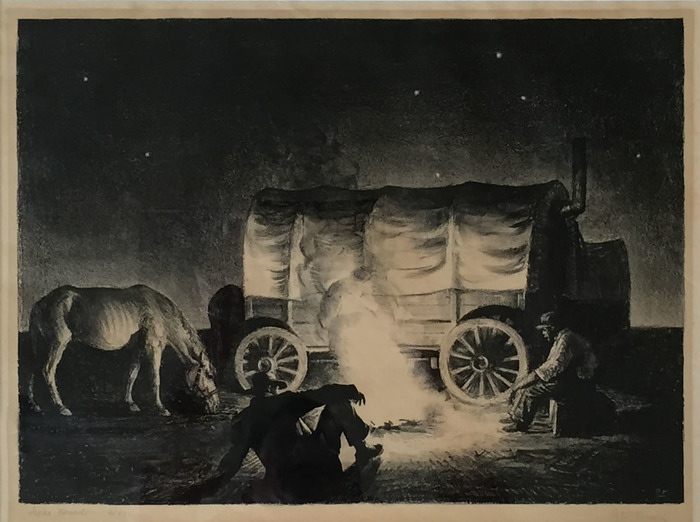 “An impeccable craftsmanship modeled the flanks of New Mexico hills and drew the cowboys raising dust in rodeos under a glittering June sky.” National recognition followed a Life article. During WWII, he was a war correspondent for Life. By 1958, he was appointed to the President’s Commission of Fine Arts. His official portrait of President Johnson for the White House collection was rejected by the president and is now in the National Portrait Gallery. 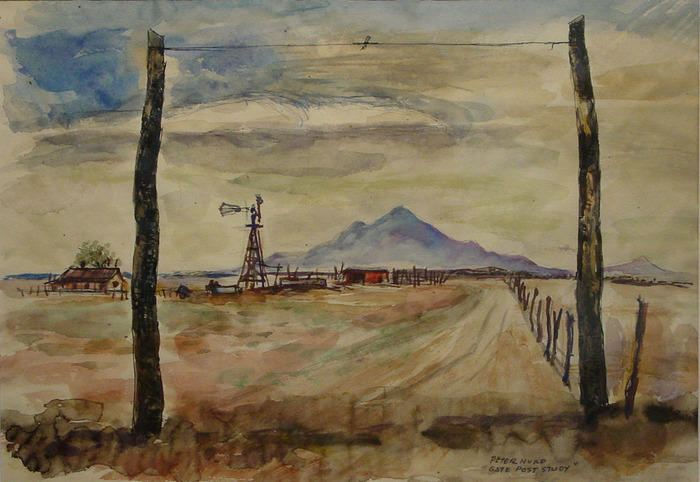 In the 1960s, Hurd turned to watercolors. Peggy and Harold Samuels, The Encyclopedia of Artists of the American West. Peter Hurd attended West Point Military Academy from 1921-23 and then studied art at the Pennsylvania Academy of Fine Art. In 1929, Hurd married Andrew Wyeth’s sister Henrietta, and moved to a ranch in New Mexico. He painted with egg tempera on gesso board from 1935 until switching to watercolors in 1960. During World War II Hurd worked as a correspondent to Life magazine (1942-45). Hurd became an accomplished portrait painter and book illustrator and was widely recognized by the late ‘30s. He was commissioned to do several public building murals as well as the official portrait of Lyndon B. Johnson. However, this work was rejected by the President, and it now hangs in the National Portrait Gallery.